In the heart of Utah, nestled under Horseshoe Mountain, is Spring City: the town that time forgot. It was founded in 1852 by James Allred and is a registered national historic district with all of the charm of a 19th century community. The town “graphically documents the techniques of Mormon town planning in Utah” and the “architecture is remarkably well preserved with an abundance of religious buildings, homes and small commercial establishments which predate World War One” (National Register of Historic Districts Report). Spring City’s early population was largely Scandinavian, influencing many of its buildings’ architectural designs. The town retains much of the same atmosphere it did when first established. The William and Margaret Beck Osborne house is listed on The National Register of Historic Places. When Margaret Osborne’s father passed away, she used her inheritance money to build this beautiful home in the Victorian pattern-book style in 1894. 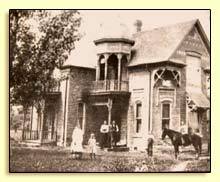 In 1896, Margaret opened the home to boarders as the Osborne Hotel. In honor of its history, The Osborne Inn opens its doors once again! The house is located on a “Zion acre” promoted by Brigham Young. It includes a chicken coop, orchard, pasture, barn, vegetable garden, and original granary- all of which were important elements to this Mormon-acre. It is said when the Great Depression befell the United States, the Osborne family did not notice as they had everything they needed on their acre. Refer to HistoricSpringCity.org for further information. Ruth May and Jesse Fox, pictured here with their Mormon pioneer family, left an inspiring legacy to their hundreds of descendants. Ruth was born in Westbury, Wiltshire, England in November, 1853 and immigrated to the United States with her family in 1865. 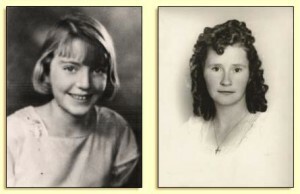 During her teenage years, she walked (and walked and walked and walked) to the Salt Lake Valley. Ruth May was an accomplished poet and author whose hymn Carry On is still sung in religious congregations today. She was also a suffragette and helped women gain the right to vote in Utah. 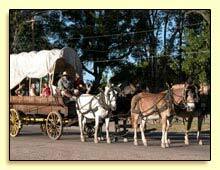 Jesse Fox, Jr., was the territorial surveyor for the land that was to become the state of Utah. 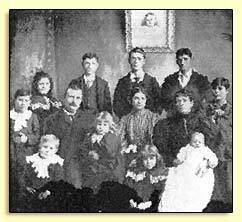 Jesse and Ruth were the parents of twelve children and stalwart in their faith. “The Kingdom of God or nothing!” was their motto. Ruth May Fox had a good memory and an active mind until her death at the age of one-hundred and four. 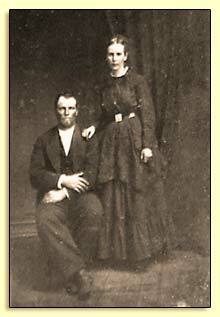 Samuel Carnahan and Sarah Rathbun were married January 12, 1871 in La Grange County, Indiana. In 1882, the family moved to Michigan where Mr. Carnahan served as treasurer of Antioch Township and held different school positions. He was elected one of the County Superintendents of the poor in the fall of 1890 and in these various offices he was ever found reliable and trustworthy, discharging his duties in a prompt and capable manner. He lived to command the good will and confidence of all with whom he came in contact and consequently gained many friends. His life was one of untiring industry and his farm was cleared entirely through his own efforts. Sarah was a good helpmate and a wonderful mother. They raised their six children to be industrious and helpful and the family worked together to erect a nice white frame house, a big barn, and several outbuildings. Their tradition of hard work, unity, and love within the family continues to influence their descendents. The Olena Louise and Evelyn rooms are named in honor of two people who were an inspiration in the lives of the innkeepers: their mothers. With Olena Louise on the left next to Evelyn on the right.